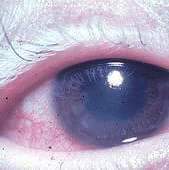 Patients with Vogt-Koyanagi-Harada disease usually initially present to an ophthalmologist for ocular problems, including sudden loss of vision, ocular pain and photophobia. Hearing disturbances and dizziness may be present. After weeks or months, most patients notice cutaneous signs (e.g. hair loss, poliosis, vitiligo). • scattered periventricular white matter lesions on T2-weighted imaging/FLAIR, and pachymeningeal enhancement.